I'm sure that all of you who squeezed into our alternative venue while the kitchen in Monomeath is being rebuilt, enjoyed the wonderful demonstration of the Cyanotype process presented by John Ansell. John had us coating papers and exposing them, developing them and then finally, toning them in coffee, green tea and red wine. Thank you John for a fun and informative evening. As notified, Monomeath is not available for our June 26 meeting which will instead be held at the Traralgon East Elderly Citizens Club. The location of both venues is shown on the following map. Please let Theo know if you will be attending and whether you will meet in Korumburra or Traralgon. Tea and coffee but bring your lunch. LVCC was well represented at the 2018 VAPS convention in Warrnambool over the past weekend. What a great event it was, great venue, inspiring speakers and the images submitted looked wonderful. At the Awards dinner on Saturday night Ian Rolfe (Pres) officially announced LVCC as next year's host for the 2019 convention. 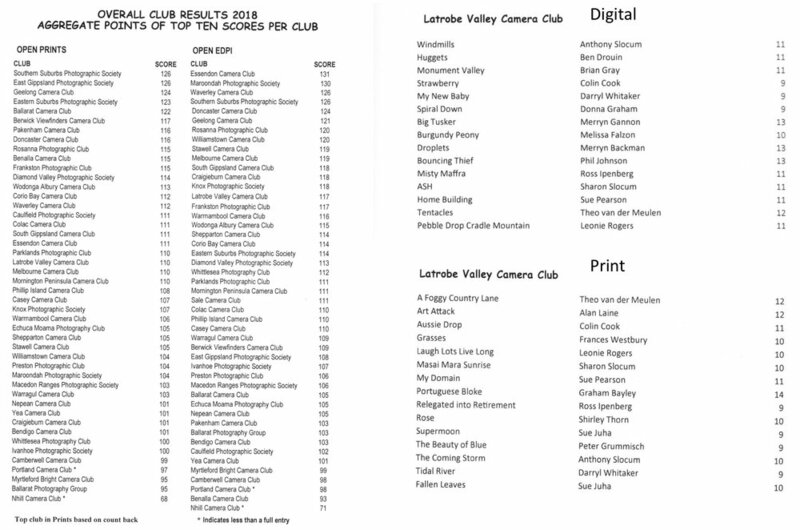 Below are the overall results of the VAPS Interclub competition. Congratulations to Keryn Gannon whose digital image "Big Tusker" was selected to represent VAPS in the Australian Interstate Photo Competition. Thank you so much for contacting me regarding our SLR Photography courses. I’m sure we can create a great partnership to the benefit of all. Our advanced class is held 6.30-8.30pm on Monday nights and our beginners 6-8pm on Tuesday nights. The beginners course runs for 6 weeks and there is an optional excursion. The advanced course usually runs between 8-10 weeks depending upon the term. The beginners course focuses on helping students understand how to use their camera and it’s settings with an emphasis on developing an understanding of ISO, aperture and shutter speed. The advanced course builds on this knowledge, various photography techniques, lighting, Photoshop etc. Both courses are held at Tara’s studio. Hi everyone, as you know Craig Wetjen is our guest speaker at the Feb 27 meeting. Craig is a renowned photographer and educator and the author of the book "Men and Their Sheds". I heard Craig speak a judges training presentation last year and I know we are in for an informative and entertaining evening.